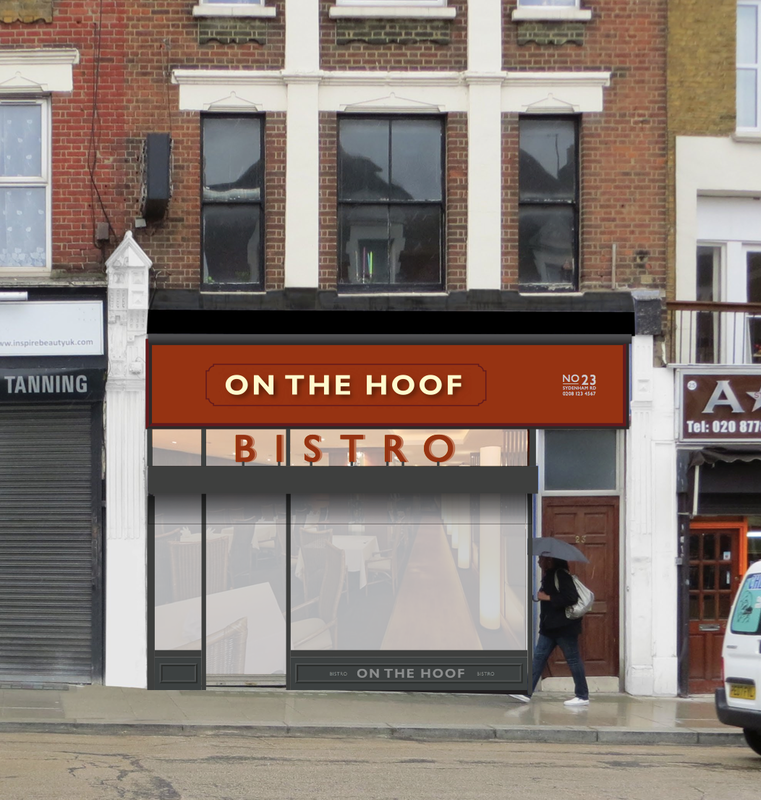 Ela from On The Hoof, a small, Local chain of coffee shops in London told us she was talking about taking over this old opticians in Sydenham to open up a bistro. 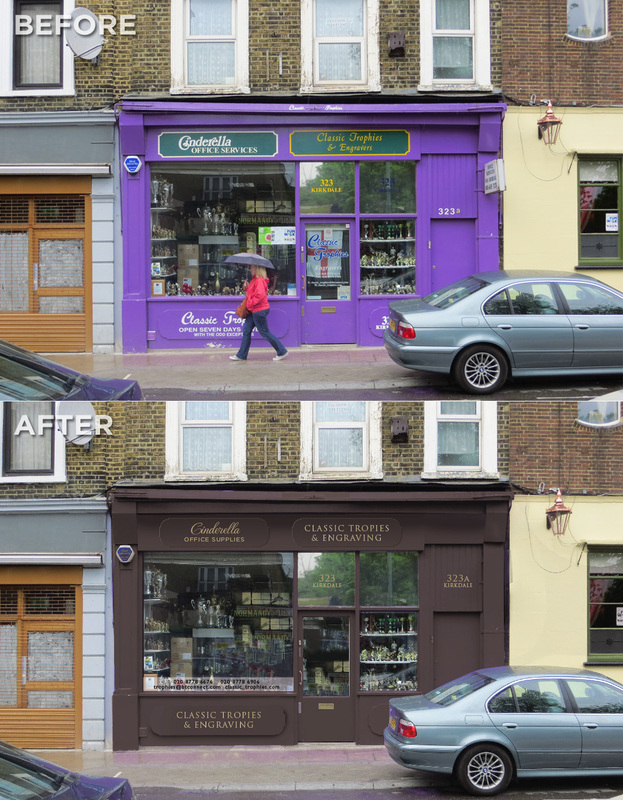 We were excited by this and she asked if we could help out with the shop front. 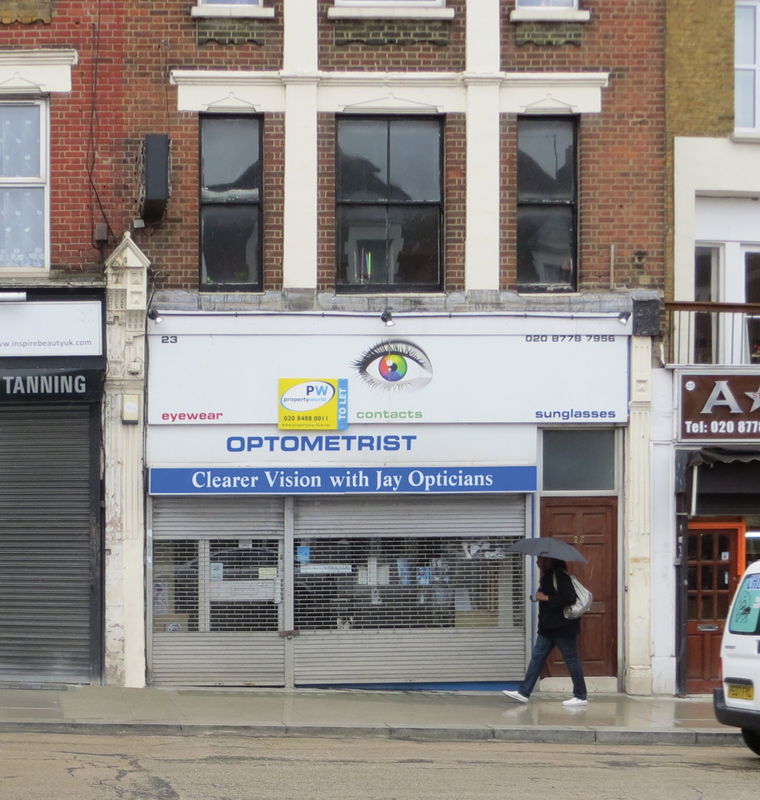 It was a challenge with the rather dilapidated roller shutter and shop front and oversize signage. 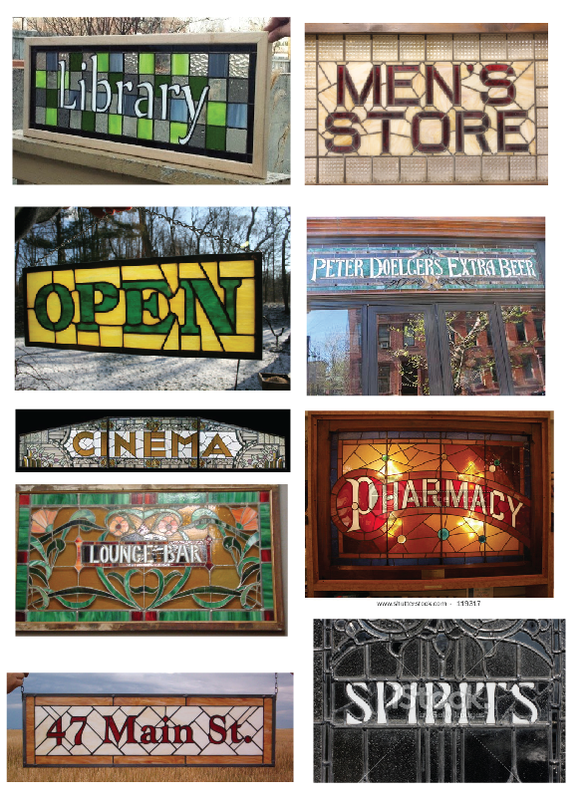 We came up with a number of different designs, some based on some lovely stained glass signs they had in the shop which they sadly never used. The inside is very up-cycled and eclectic, so we tried to bring some of that to the exterior. They didn’t use the designs in the end, but we thought we would share some of the various designs we produced. It’s a fantastic bistro and very popular since it opened. Its wonderful inside and the food is absolutely top notch. 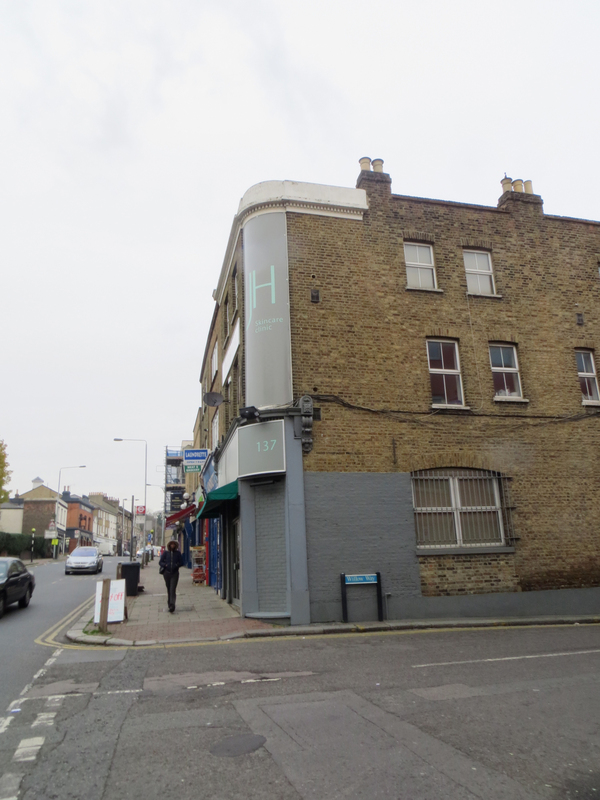 It’s great to have such an exciting new business in Sydenham. Kirkdale has two distinct areas separated by a long residential area. 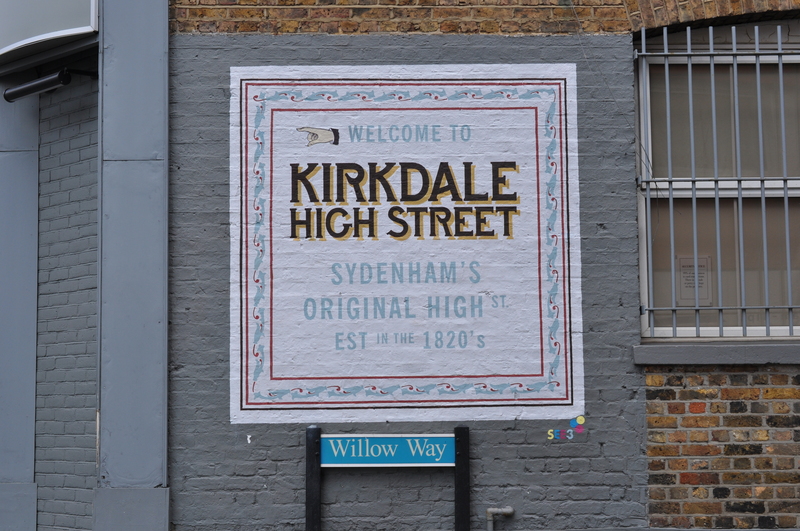 Many people don’t know the top part is still part of Kirkdale. Could this grey wall could be put to better use? 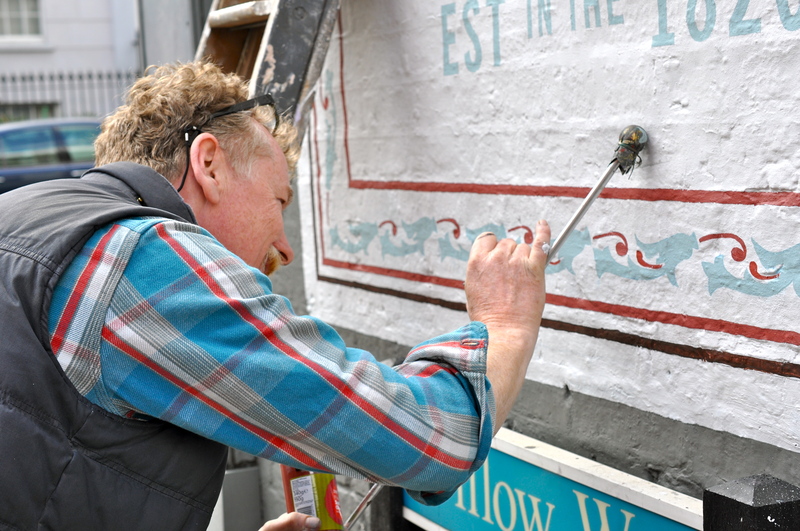 And here is the signwriter, Peter O’Connor lovingly applying his craft. Local reaction to the signs can be found HERE. Sydenham has a deli. 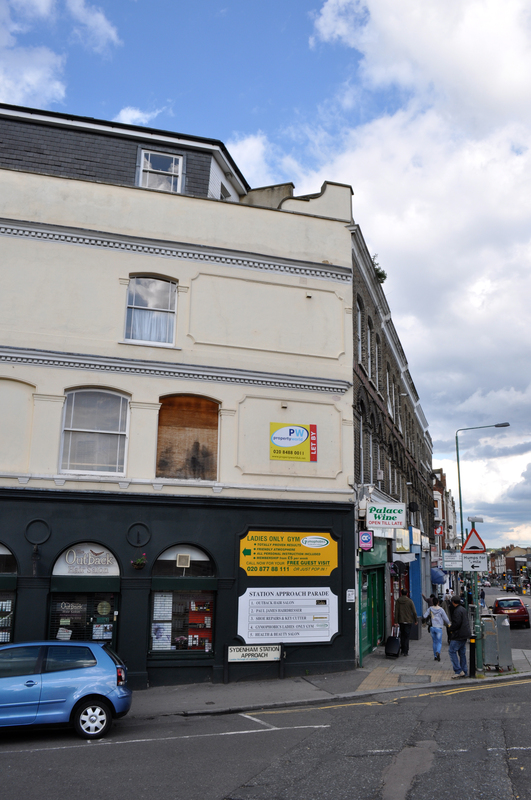 The owners are really nice and we piped in a little while ago to ask if we could help them. It always seemed a bit quiet and normally deli’s get people talking (like this one we did earlier). Chalk boards with single offers on them (just painted marine ply boards, very cheap), cover the stall risers in some dark blue brick tiles and some simple signage and cleaning up the top of the building can make a huge difference for little cost. They could upgrade this and get the panel between the windows digitally printed onto tiles (as we are doing with the Greyhound Mural). You can read more feedback on the Sydenham Forum. So far all the comments have been great! 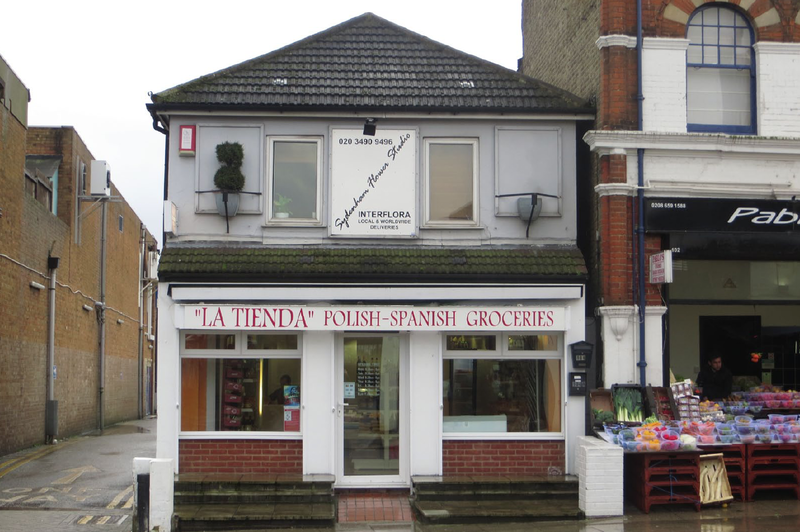 Another shop that we spoke to after speaking at a local traders association meeting. We had never been in the shop before and it’s rather beautiful with lots of original features. I’d implore anyone living in Sydenham to pop in and have a look, it’s an absolute local treasure. The outside doesn’t really do it justice. The shop front is nice with a traditional awning. It’s actually two shops in one. Making the shop front calmer and making it feel like it’s been around a long time while acting as a frame for the window displays also makes the shop name stand out. For the trophy signage this would look great if gilt and engraved. 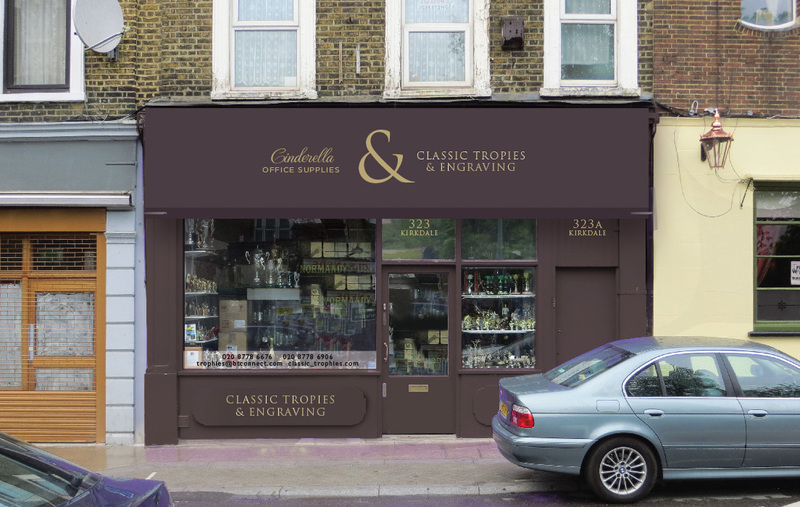 The awning is a great opportunity to show that there are two shops in one, which is why it has the large ampersand. UPDATE: you can read more feedback on the SYDENHAM TOWN FORUM. 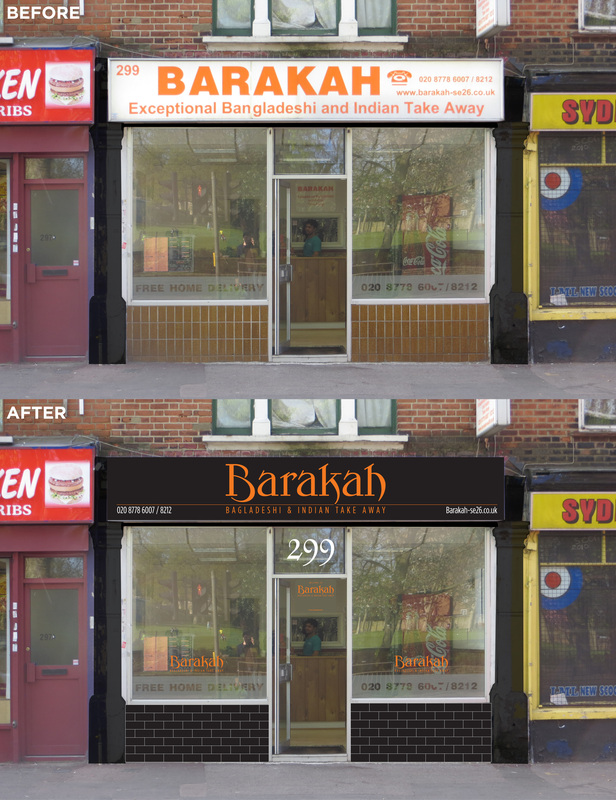 We were approached by the owners of Barakah after giving a talk at a local traders group to look at their shop front. We got one of their mailers through the door a long time ago and were seduced by it’s uncoated paper and smart black and orange livery. It felt quality, something rather different to the usual glossy, over complicated rubbish that falls through our letterbox. We kept the menu and when the food turned up we were pleased to note that the quality of the food matched the expectation. It was some while later when we realised that the place we were ordering from was a 5 minute walk from our front door and looked nothing like any of the marketing material that they were sending out. So the job here would be simple. 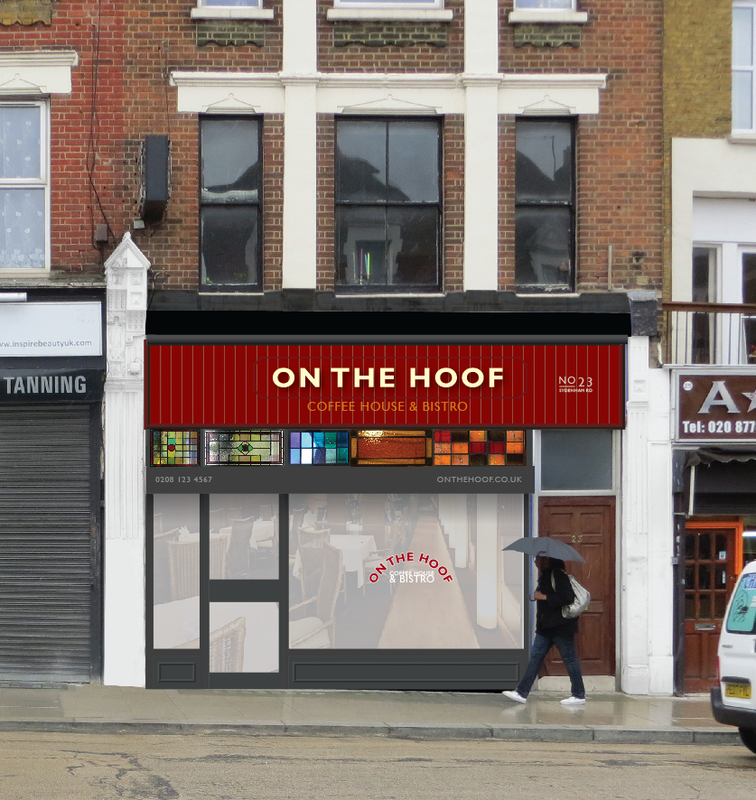 Make their shop look like the brand they send out to thousands of homes in the area and make it reflect the surprisingly good quality food that they send out. So we have used their logo and colours. A bit of black paint, a re-skinned light box in black and orange and some new window vinyls and black brick tiles to tidy up the stall risers can make a huge difference. UPDATE: you can read more feedback here on the SYDENHAM FORUM. Originally there would have been some painted signs on this building. When I first came to Sydenham I didn’t notice the station was down there. There are no signs to announce that you are in Sydenham. We love the idea of art being relevant or functional in some way. Sydenham is getting an expensive makeover of station approach and On The Hoof, our new rather fab station cafe with seating outside. It makes sense to celebrate this in some way. 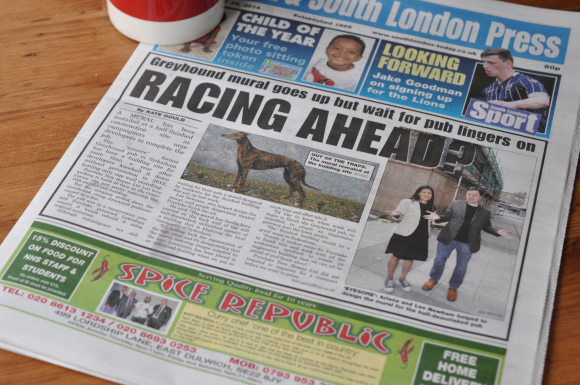 It also makes sense to advertise Sydenham’s great transport links now we have the Overground. 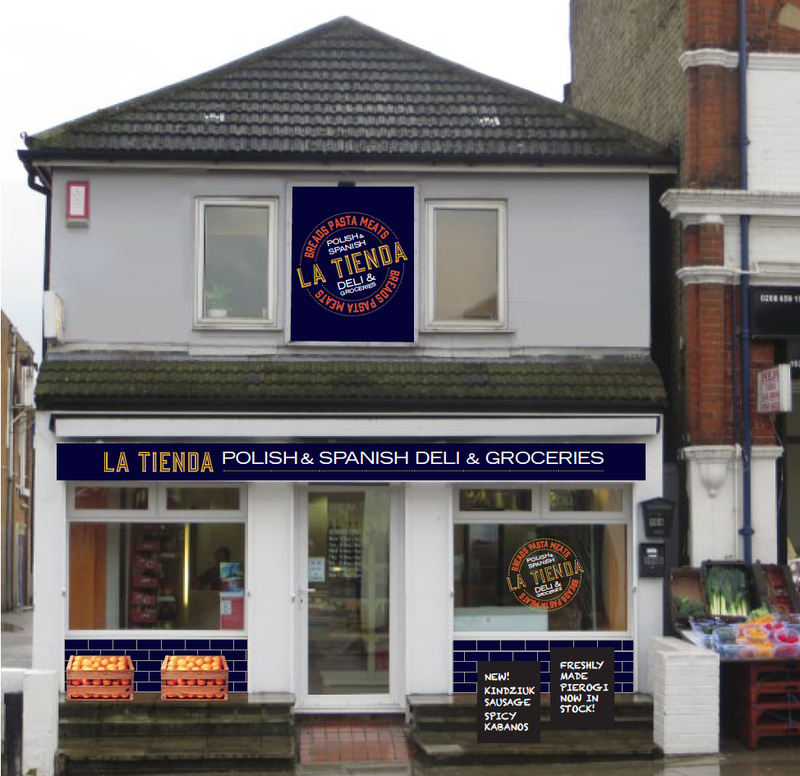 We have had this idea for a while now and presented it to the SEE3 group as funding is available for signage in Sydenham, Forest Hill & Kirkdale. We are also advisors for the GLA (Greater London Authority) who are supplying the funding (we are designing this for free, as all the ‘What If Sydenham’ projects have been, this costs US money!). We also included a visual for Property World’s ‘panel’. We normally approach business before we do this sort of thing, but this time we thought we would do it the other way around (we hope they don’t mind, but it gets them some free feedback). Property World are very active locally and support out local arts festival and the ‘Arts in The Park’ in Home Park (which we also support with free design work). 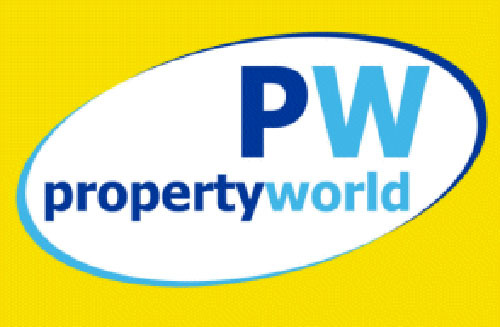 We understand that PW actually rent the advertising space but for ages just had one of their plastic ‘LET’ boards in there for a property that was no longer on the market. They kindly took it down after we posted on a local forum kindly asking them to remove it, which they did (we gave them a bottle of champagne as a thank you) which shows that they are very community minded. 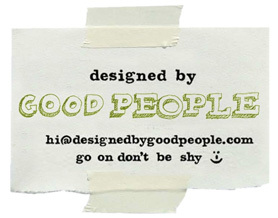 The idea is that we would create a retro version of their logo so it looks like it’s been there for ages. This makes them feel part of Sydenham and have been long established in the area, which is true. 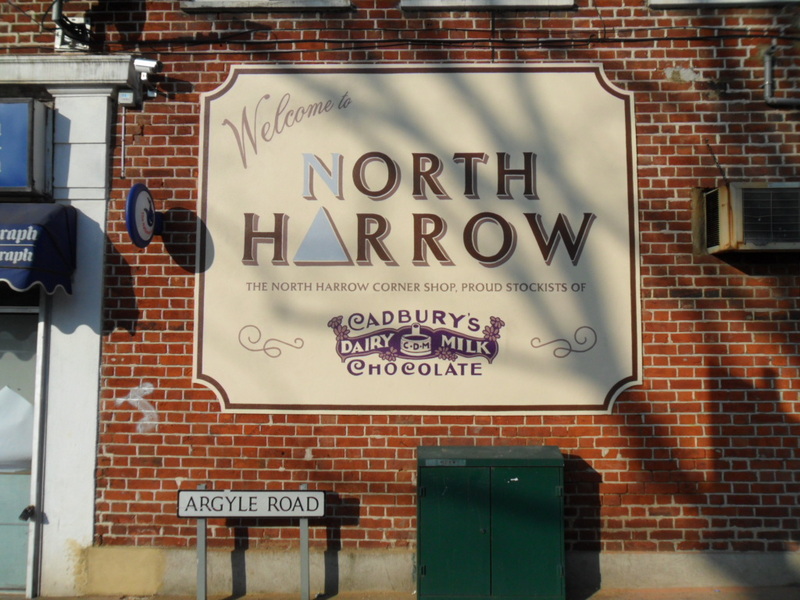 We did something similar in North Harrow where we designed a logo for the area but then created a retro version of it, which we painted on the side of a building. We could get it distressed (as with the visual) or add the dat the business was started. 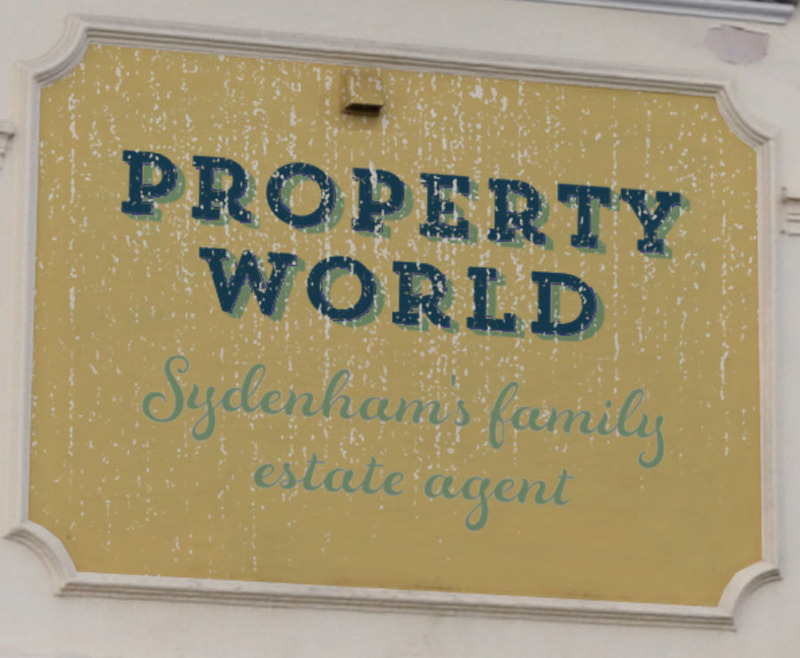 we don’t think it should be a sponsored ‘Welcome to Sydenham sign’, they can be a bit tacky and are not what would have been on the building originally. We are still waiting to hear from SEE3 on how the money will be spent but Cllr Chris Best and the team were really positive about it. 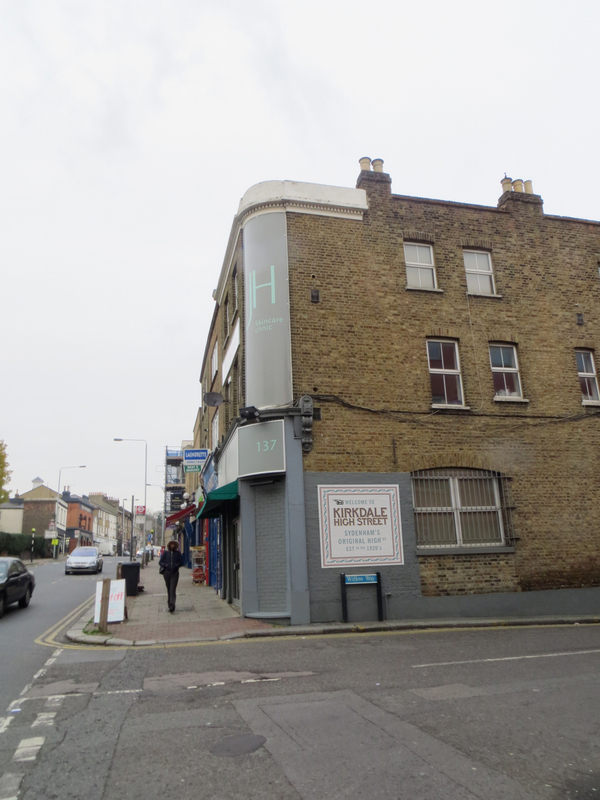 Hopefully, as SEE3 and Especially Cllr Best have championed art in Sydenham in recent years with her backing to the Mosaic on the Naborhood Centre and the new Street art festival, we hope that this will get the go ahead too. 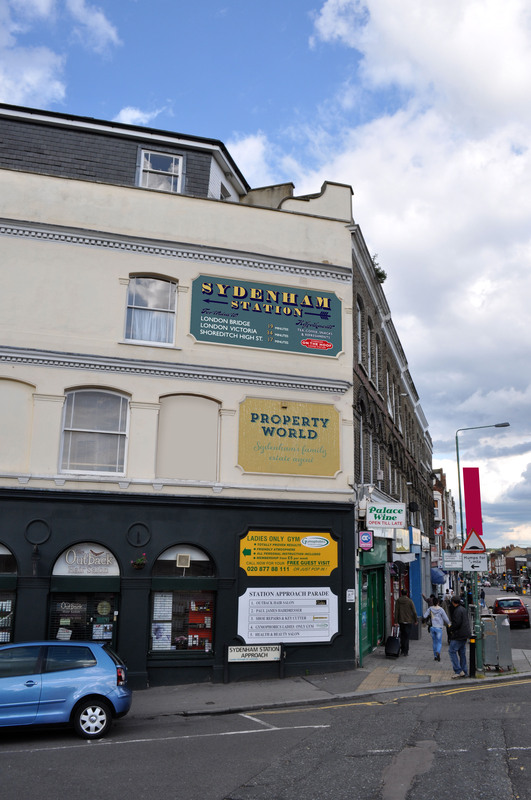 You can read the feedback and comments from the Sydenham Forum here.